The CIT-10 is a complete test system for conducted RF-immunity tests according to IEC/EN 61000-4-6, ISO 11452-4, MIL-STD 461 CS114, SAE-J1113-2, DC 10614 and similar standards. Its internal RFgenerator and RF-power amplifier produce output signals with max. up to 150 W within a frequency range from 100 (10) kHz up to 400 MHz. Generated signals are measured via one of the max. 3 internal RFVolt-meters. Furthermore via an optional, internal directional coupler forward and reflected power can be measured. The whole test system allows full au-tomatic tests for the specified frequency range. As a “stand-alone” test system the CIT-10 is convincing by its easy and comfortable handling and the excellent cost-performance ratio. Addons like coupling/decou-pling devices are available as well. Testing according to IEC/EN 61000-4-6, ISO 11452-4, MIL-STD 461 CS114, DC10614 can be performed automatically. The internal amplifier amplifies any signal from 100 (10) kHz up to 400 MHz. By using the internal generator a desired narrowband signal can be generated. Signals up to 30 dBm can be measured at the same time. If a directional coupler is installed, forward and reflected power are measured as well. Several amplifier modules are available. Highest output power can be 75 W over the specified frequency range. The amplifier input can be accessed via the back panel of the CIT-10, so that the amplifier can also be used with any external generator. 25 W and 75 W amplifiers are available as standard. Frequencies generated by the generator can also be modulated with a LF signal. Modulation frequencies may vary from 1 Hz up to 100 kHz, modulation levels are available from 0 % to 100 %. Accurate measurements of RF signals from -40 dBm up to +30 dBm are done by the internal RF-voltmeter which can be accessed (for separate use) via a BNC connector. Two internal voltmeters measure the forward and reverse power on an optional available directional coupler. If no directional coupler is installed, the output voltage of the amplifier is measured. As the internal generator generates its output signal without any internal mixing components, low harmonics and spurious frequencies are assured. External signals (e.g. EUT-fail or external instruments) can be connected and monitored using the application software. step width, test voltage etc. are made by means of the control software which is also included in the delivery. The three functional units RF-signal generator, RF-power amplifier and RF-voltmeter are set automatically by the software, depending on the pre-set test parameters. Each component, however, may also be called and operated as separate measuring and testing equipment. This means: using the CIT-10 as testing system, you have three full, additional “single units” at your disposal, for which separate inputs and outputs are available as BNC connections. Due to the computer-aided control of the CIT-10, any modifications which may become necessary, for example, due to the revision of standards, may be performed without problems and without having to manipulate the hardware of the equipment. In <CDN-Calibration> the CDNs (Coupling/Decoupling Networks) serve to inject the test voltage into the lines to be tested and/or to decouple any connected peripheral equipment from the EUT. The characteristics of the CDNs as well as of the power amplifier are not absolutely linear over the whole frequency range, i.e. the amount of power required to generate a constant test voltage over the whole frequency range varies slightly, depending on the frequency. In the calibration run, the frequency-dependent output level of the signal generator, which is necessary for a constant test voltage, will be determined and stored in the software, together with the defined frequency range and the desired test voltage. The data records thus created may then be stored and recalled for tests. When selecting <Self-calibration>, the test equipment will perform a self-calibration. 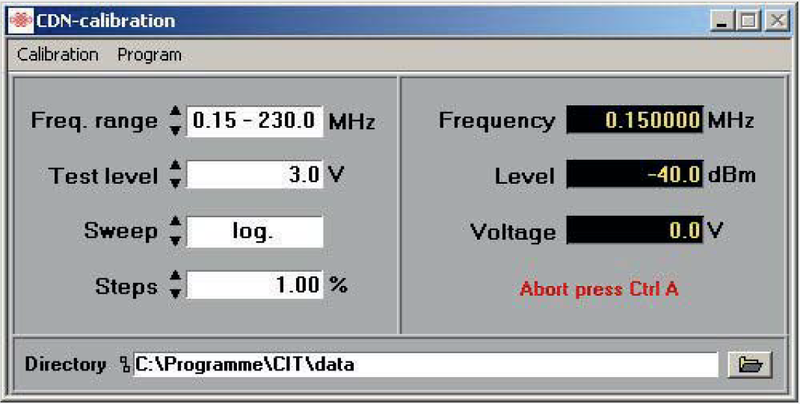 In this case, the output of the signal generator must be connected to the input of the voltmeter. The equipment is ready for operation immediately after connection with the USB port and installation of the drivers and the control software. 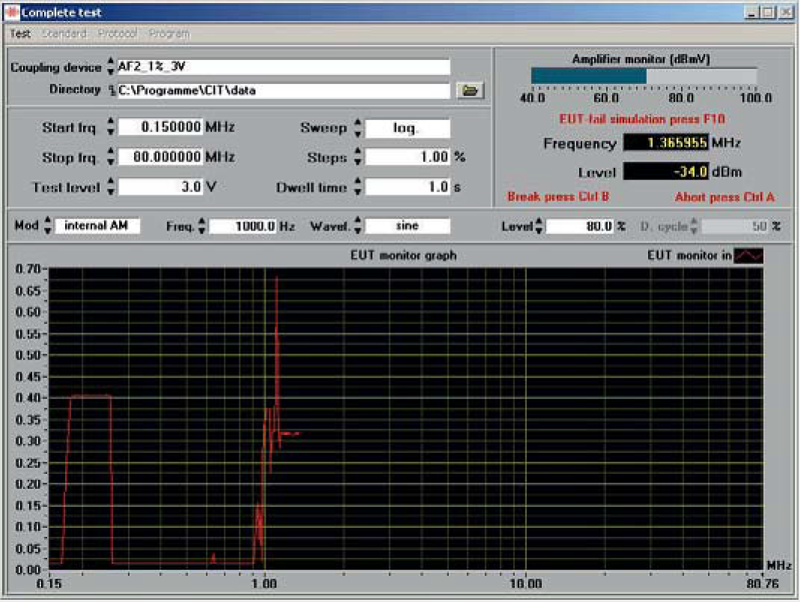 After starting the control software, the main menu offers the manual control of <RF-Generator> and <RF-Power Meter>. Further options in the menu are <Calibration> (1) (<CDN-Calibration>, <Self-Calibration>) and <Test> (2) (<Complete Test>, <Selective Test>). The menu option <Test> offers the selection possibilities <Complete Test>, <Selective Test> and <Protocol>. The settings for a test, e.g. start and stop frequency, step width and test voltage are made automatically via the calibration file of the selected coupling unit. It is now possible to decide whether the test is to be performed exactly according to these pre-settings, i.e. exactly as in the calibration, or whether modifications of the pre-settings shall be admissible. If the calibration run was performed, for example, for a test voltage of 10 V, and the test is to be performed now with 3 V without having to perform a new calibration run for this purpose, this can be done by selecting menu item <Extrapolation>. entered dwell time. If there is a malfunction of the EUT, the test may be stopped at any time. It is then possible to either increase or reduce the frequency by any number of steps, as well as to switch on and off the modulation and test voltage. Besides, a description of the malfunction occurred may be entered in a comment line which is included in the test record. <Selective Test> offers the possibility of testing the EUT at discrete frequencies. This can be done either with a fixed test voltage or, optionally, with a ramp function. In case of the ramp function, the start and stop voltage, the step width by which the test voltage is to be increased, as well as the dwell time between the individual steps may be preset by the tester. The standard <Protocol> consists of the head of the protocol and a diagram which shows the test results. In the head of the protocol the date and time are taken over from the computer; in addition, details like temperature, air humidity, tester, as well as testing set-up and EUT, may be registered. The protocol may be printed directly. It is also possible to edit the protocol individually. The CIT-1000 is a further development of the for years available and proven „CIT-10“, with the extended frequency range up to 1200MHz, stand-alone-operation via integrated Touch-Screen-PC as well as integrated directional coupler and power-meter for forward and reverse power measurement. As usual with our CIT-series, all integrated instruments, like Signalgenerator, RF-Power-Amplifier and the 3-channel-RF Power Meter can be used as „stand-alone-unit“, too. Hence, the Signal-generator and the RF-power-meter can also be used for radiated immunity tests acc. IEC/EN 61000-4-3. Furthermore an additional external RF-Power-amplifier could be connected to the CIT-1000 for this purpose. Signalgenerator, RF-Power-Amplifier, 3-channel power-meter and directional coupler combined in one 19“-case.